In the upcoming year your baby will grow from being a tiny helpless infant to a chubby toddler running all around your house. 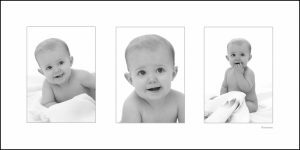 These changes in your baby’s growth are absolutely amazing to watch, and happen so fast that it is easy to overlook having professional portraits taken to record your baby’s first year. This is where we can help. Your baby’s first year deserves more than just “snapshots”. We will photograph your baby at 3, 6, 9, and 12 months. A perfect way to celebrate your child’s first birthday!